What Are The Different Certifications in Nursing? At first glance, the different certifications in nursing may seem confusing. But, the majority of nursing certifications establish a professional hierarchy that is easy to understand. While some lesser-known certifications denote a professional’s expertise in a certain specialty, the most commonly discussed nursing certifications are based on the level of education nurses have achieved and the amount of professional responsibility they are expected to carry. Certified nursing assistants sit at the bottom of the nursing career ladder. Although the details vary slightly from state to state, certified nursing assistants are generally required to spend a few months completing a vocational training course offered by a hospital, high school or community college. This course provides students with the knowledge and skills necessary for basic nursing duties and allows them to garner some clinical experience. After passing their state’s licensing exam, certified nursing assistants are responsible for carrying out the most basic of patient care under the supervision of higher-ranking nurses. Often working in hospitals, nursing homes and rehabilitation centers, certified nursing assistants can expect to earn around $24,000 a year, according to the U.S. Bureau of Labor Statistics. One rung higher on the nursing career ladder, licensed practical nurses take a one-year training program that includes both practical nursing and pharmacology courses. Offered by hospitals, colleges and universities, these programs should be accredited by the National League for Nursing Accreditation Commission. After completing the program, students must pass the National Council Licensure Exam for Practical Nurses. Once licensed, they work under the supervision of higher-ranking nurses and physicians to perform most common nursing tasks. Employed by doctor’s offices, clinics and hospitals, licensed practical nurses can expect to earn an annual salary of approximately $40,000, reports the U.S. Bureau of Labor Statistics. The group that best fits the public’s perception of nurses, registered nurses earn either a two-year associate degree in nursing or a more detailed four-year bachelor’s degree in nursing. 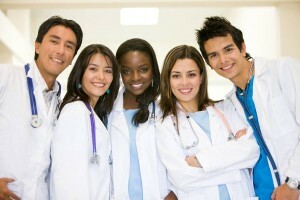 After graduating, they must pass the National Council Licensure Exam for Registered Nurses. Capable of working independently to deliver patient care and perform all standard nursing duties, registered nurses work in hospitals, doctor’s offices, nursing homes, correctional facilities and schools. While some variation may result from the differences in geographic location and exact job duties, the U.S. Bureau of Labor Statistics says that these professionals earn a median salary of $65,000. Advanced practice registered nurses are registered nurses who have completed additional training that qualifies them to tackle more complex responsibilities. Generally among the most highly educated professionals in the field of nursing, many advanced practice registered nurses hold master’s degrees. They work as nurse midwives, nurse anesthetists and nurse practitioners. In some states, they are allowed to deliver care without direct oversight; other states require that a physician approve all treatment delivered by an advanced practice registered nurse. Annual earnings for advanced practice registered nurses are typically about $96,000, according to the U.S. Bureau of Labor Statistics. With the country’s aging population and new health care laws driving an increasing demand for health care services, the U.S. Bureau of Labor Statistics is predicting that job opportunities for nurses at all levels of certification will grow at a rate much faster than average. People interested in pursuing a nursing career should carefully consider the different certifications in nursing as they weigh their options and plot their professional course.